The Nationals’ rookie phenom Bryce Harper is in the final four players that could be named to the All Star Game this year in Kansas City. The young outfielder has had a tremendous start, putting up a strong slash-line (.280/.354/.478) despite the fact that he’s the most pitched-around player in the National League right now. His 23 RBI put him tied for fourth on the Nationals’ depth chart, and only Adam LaRoche has him beat for OPS. But is he an All Star? If the All Star Team is about enthusiasm, yes, absolutely, Harper belongs there. There is no player in the bigs right now playing with the sheer emotion of Bryce Harper, for better or for worse. Harper’s played the game like his hair’s on fire since coming up in late April. His hustle and charge mentality is unquestioned, though it appears to require the seasoning of experience, as Harper’s been caught several times trying to add an extra base to a single or double, or getting a little too excited on the basepaths. 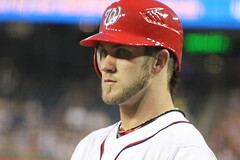 If the All Star Team is about production, though, Harper’s argument is far less clear cut. Atlanta’s Michael Bourn is the better outfield according to just about every major stat. Bourn is 5th in the NL in Wins Above Replacement with 3.9 (Harper has just a 1.4 WAR rating) and appears in 18 different top ten lists of NL stats. Harper, unfortunately, doesn’t make a single one of those lists, but he’s got about 20 fewer games than most of the leaders. Perhaps Harper should get a good three days’ rest with his family back in Vegas and come charging back into the season after the break. They’re going to need Harper’s offense down the stretch, and a pause might do him some good.